It is no surprise that William Hill refers to itself as the ‘home of betting.’ The renowned UK bookmaker has come from being a telephone and postal betting service when it was founded in 1934 to being one of the most trusted brands in the betting business. Its popularity can be felt both at home and internationally having been licensed in many parts of the world. 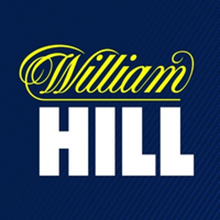 William Hill was listed on the London Stock Exchange in 2002 and has since grown to dominate a sizeable share of the UK online betting market. It boasts of over 2300 betting shops and a boatload of other benefits for its members. Although its £30 welcome bonus is not the most alluring, there are other factors that easily place William Hill ahead of other betting giants. For instance, they have excellent withdrawal speed with a wide variety of payout options, amazing site design, a memorable online streaming experience and great customer service. If you open an account with William Hill for the first time, you will be credited with £30 in free bets. But like with most UK bookmakers, this bonus does not come freely. There are a few terms that you should observe in order to be eligible for the welcome bonus. For instance, you have to be a new user who has not previously created an account with William Hill. You are also required to deposit a minimum of £10 which you use to place your first bet at odds of 1/2 (1.5) or greater. You will be credited with the £30 free bet only when you win your initial bet. The bonus is only eligible for residents of Ireland, UK, Jersey, Isle of Man and Guernsey. It expires after 30 days if not used and you cannot withdraw the free bet from your account. Although some of the online betting sites in the UK offer online streaming functionalities, very few of them matches the quality you will find at William Hill. If you are the type who enjoys watching after placing their bet, there is no doubt you will love the William Hill Streaming experience. Through their William Hill Betting TV, which can be accessed both through the website and mobile app, you get to enjoy exhilarating free-to-air US racing games, a variety of football matches, tennis matches and a few major basketball clashes. Of course you can also enjoy UK, Irish and South African horse racing, but you must have placed a qualifying bet on the race first. You can also watch the majority of UK greyhound races. Territory restrictions may apply. To enjoy the free streaming, you should have placed a bet within the last 24 hours. To do this, you simply need to look for the live streaming page, which is mostly found below the list of sports shown on the site. You can also enjoy William Hill Radio which offers full free coverage of all the daily sporting events. Listen to betting experts give their previews and tips and enjoy the live race and match commentary. Being an online betting site, you would expect William Hill to be cluttered with a plethora of sports matches, promotional ads and a ton of bright flashing colours. On the contrary, the site employs a clean design that is exceptionally appealing to the eyes. If you are not logged in, for instance, you will be presented with a beautifully designed page with minimal text flying around. Their login page is also clean and easy to use. For logged in users, the home page is a bit busy, but still cleaner than what we see with most betting sites. 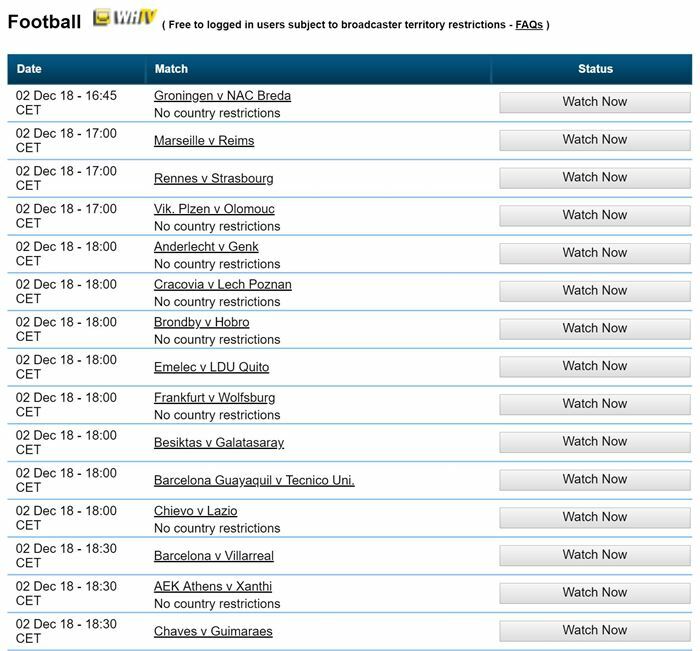 Available games are listed on top of the page with the body being mostly occupied by betting markets. The site utilises top-notch betting PlayTech software, which easily outshines other UK sportsbooks in terms of efficiency, speed and ease of use. One of the reasons why William Hill has been able to keep the competition at bay for so many years, we think, is because of its withdrawal speed and options. The speed at which they process withdrawals is comparable to only a few bookmakers in the UK and Ireland. This attribute encourages many sign-ups every day, adding to the ever-increasing community of sports betting enthusiasts on the site. They don’t just have fast withdrawal speeds, they also accept a variety of currencies and withdrawal options to ensure that every customer is taken care of. Cheque (the UK only) – You will be told the timescale when your withdrawal request is received. Unlike with other betting sites, you will not be charged any withdrawal fees. Address: Greenside House, 50 Station Road, Wood Green, London, N22 7TP. You can also have a one on one conversation with the support team through live chat on the website. The best bit is that you can even visit their help page and go through the Frequently Asked Questions (FAQ) and see if you can find a solution to your inquiry. YourOdds – This allows you to have control over your own bets. Acca Five Insurance – If you had placed a multi-bet of more than 5 selections and one of them lets you down, you get your money back. High 5/ 2 Clear – Promotion for racing bettors. If you pick a winner that is at least 5 lengths away from the remainder, you are credited with a 15% free bonus on top of your winning. 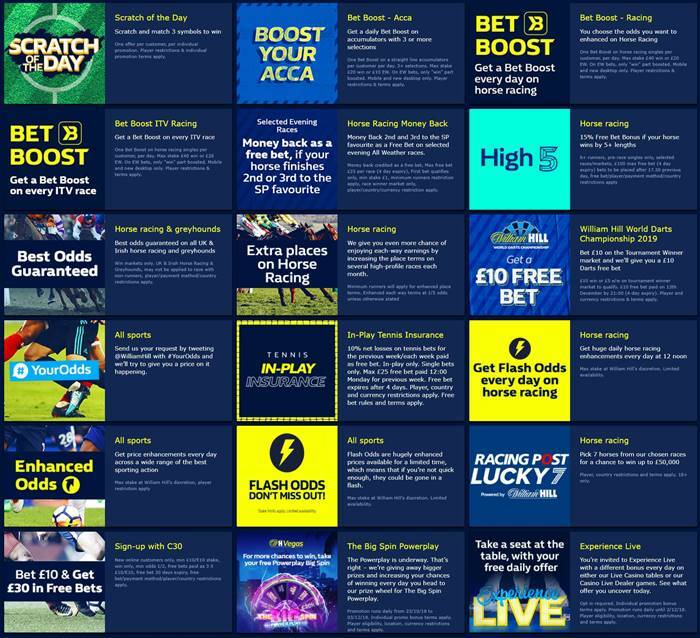 Bet Boost On ITV Racing – Get bet boosts on ITV covered races. For more amazing promotions, visit the William Hill promotions page – https://static.williamhill.com/sport/betting-30/. 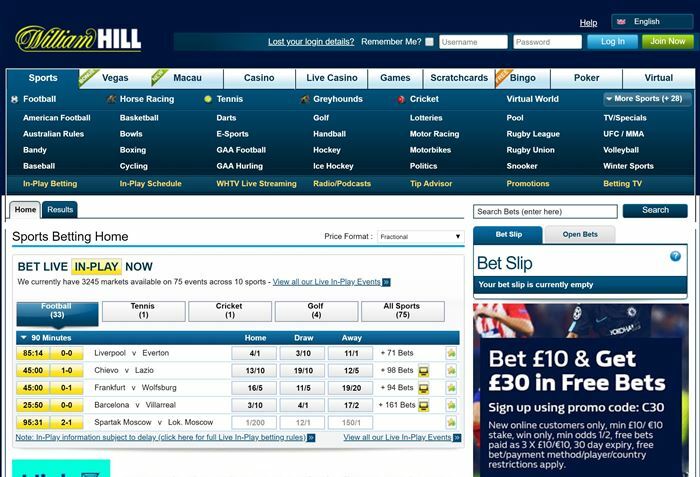 William Hill continues to thrive even as many online sports betting sites mushroom around the world. Its transition from old school to the modern way of betting was phenomenal and has positioned it at the forefront of the UK betting market for many years. We believe that its credibility, ease of use and the wide variety of betting markets will make it a dominant force for many years to come. Easy to register, good customer service. Can't really fault them. Opened an account on William hill vegas £10 play with £50 meet wagering 6 hours later cashing out x60 my despoit at 23:00 hrs on good Friday and money hit my account at 13:00 on Easter Saturday now that's quick and no KYC docs required. Yes bonuses are keek IMHO but that's grand means I'm not wasting time wagering.